Some critics claim that Millions of Cats was the first truly American picture book done by an American author/ artist. Prior to its publication in 1928, there were only English picture books for the children's perusal. Some have gone so far as to say it initiated the picture-book movement in America. It certainly sky rocketed Wanda Gág into instant fame and set in stone her reputation as a children's author and illustrator. It is considered a classic of children's literature and continues to remain in print to this day. Gág designed as a whole each two facing pages of the opened book, termed a "double-page spread." This was her own innovation and many future American illustrators have since utilized this stylistic device. The Caldecott Award had not been established at this point in history, or it is a sure bet Millions of Cats would've been awarded it. Although she went on to write and illustrate numerous children's books for the next ten years, there is a general consensus that this book is her masterpiece. Wanda was a classically trained and educated artist, knowledgeable in many respects about the great artists and styles that came before her time. She was also a fierce idealist and did not believe in altering her own aestheticism just because she was producing work for children. She liked to use stylized human figures, asymmetrical compositions, strong lines and slight spatial distortions. The real source of her expressionistic pictures can be traced back to her own discoveries as a young art student in Minnesota. She had a strong desire to get at the "essence" of the object and idea, which meant she was going beyond visual description through stylized design. She epitomized Lynd Ward's description of the realist credo: "I will make the best pictures of which I am capable, whether for children or grown-ups." She also had a keen sense for detail and authenticity. For Millions of Cats she used her own two cats as models. Her use of white space and her acute sense of design principles can be seen in the last picture in the book. 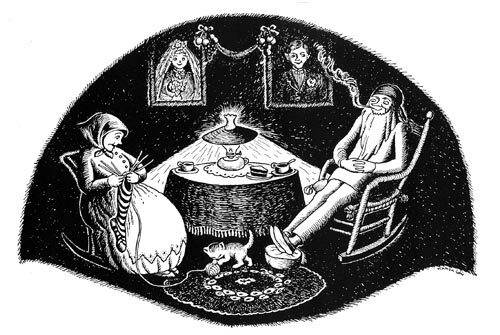 Although she does not specifically write the words, "and they lived happily ever after," as readers we get the distinct impression that the old man and the old woman actually do. In the background are their happy wedding photos, and the picture itself feels very intimate and cozy. Gág uses circles in this final frame which are pleasing to the eye and suggest harmony. Note the circular rug, table, and light emanating from the lamp on the table. There is a great deal of symmetry in the scene as well and the eye notes a feeling of satisfaction and contentment. The story's text itself was printed by Wanda's brother, Howard. The handmade lettering not only fits comfortably around the illustrations, it also serves as a visual link between the pictures and the story. This departure from standard type was considered a novelty when the book was published. Anne Carroll Moore, children's librarian for the New York Public Library, in her original review of the book, thought the handlettering would make a child "almost feel that he has made this book." Wanda was indeed a perfectionist and took great pride and care in her art. In all of her work she successfully combines the mystery of technique with a meticulous standard of craftsmanship. She once said that she tried to make her illustrations, "as much a work of art as anything I would send to an art exhibition." 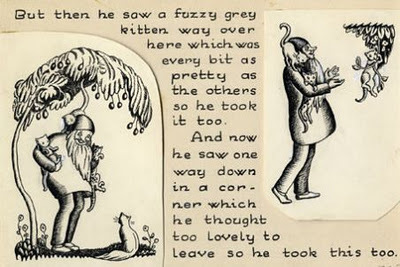 Children can sense the up and down rhythmic quality of both the text itself and the illustrations as the very old man traverses rolling hills and winding roads in his search and retrieval of the cats. The rhythm of the verse and the repetition of the words are all mirrored in the pictures sprawling across the pages. The lovely and repetitious nature of the text no doubt originates in the sounds and stories from Wanda's youth and the prevalent oral tradition within her own family. Most critics believe that Millions of Cats is a product of Wanda's "mature imagination" and is an original story based on a synthesis of folktales simmering since early childhood. The story itself, in fact, existed first in oral versions. It is said that Wanda invented the story for the children of friends she was living with in New York in the early 20's. She perfected it through frequent retellings, as it was begged for again and again. Millions of Cats uses rhythmic language and cadenced rhyme, devices of repetition and refrain belonging to the oral tradition.